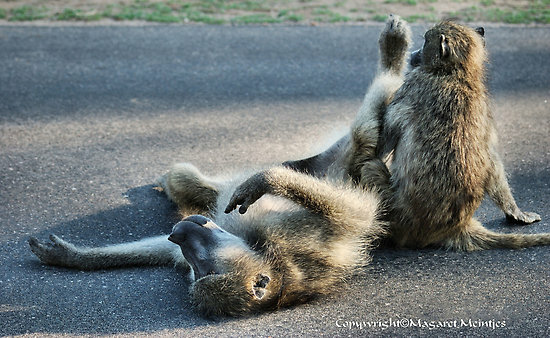 Low costs of allonursing in meerkats: mitigation by behavioural change? Is cooperation really cooperation if it imposes no cost on the giver? Two things are usually assumed about cooperative behaviour: that it provides a benefit to the intended receiver, such as the removal of ectoparasites from groomed individuals, and that it incurs some cost to the individual participating: whether that’s time that could be spent doing other things (such as eating), or an energetic cost (in terms of energy expended). I was also interested to find out if females alter their behaviour to mitigate the costs of allonursing (if it did in fact turn out to carry a cost). Imagine you were going to run 10km every day for three weeks. To help you meet the energetic costs of doing that much high-octane exercise for such a long period you might do two things: eat more, to make up for the energy you’d lose on your runs; and you might also dial back on other activities to help conserve energy – skipping your pilates class, for example, or getting an extra hour’s rest at night. 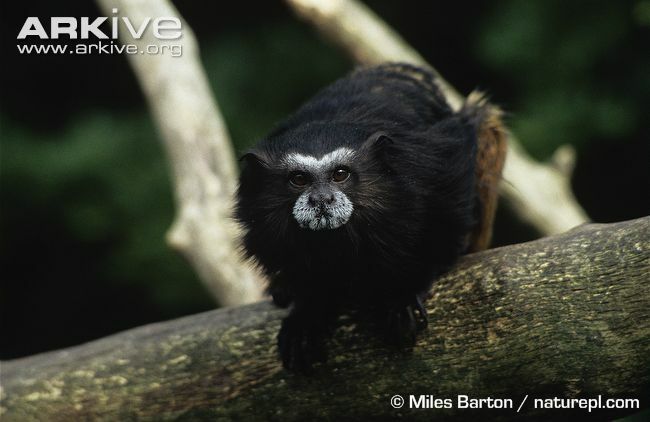 This sort of behavioural modification is seen in lactating animal mothers: lactation is thought to be such an energetic slog that mothers benefit from considerably upping their food intake (as in saddleback and cotton-top tamarins: Goldizen 1987; Price 1992), or spending less time doing other activities, such as in baboons, which spend more time resting when lactating (Barrett et al. 2002). In order to achieve these two aims, I looked at two things: how allonursing influenced weight change, using body mass data from the long term database; and how allonurses differed from non-allonursing females (of the same age and weight range) in their behaviour during the period of lactation. Body mass is an important predictor of success in meerkats, which is why I decided to use this measure to test costs of allonursing. Heavier females are more likely to survive, breed, and attain dominance (Clutton-Brock et al. 2001; Russell et al. 2003; Hodge et al. 2008), so if contributing to allonursing results in weight loss, this could spell problems for females hoping to eventually have young of their own. However, although lactation is thought to be a hugely costly aspect of offspring care (Clutton-Brock et al. 1989), allonursing female meerkats didn’t lose more weight overnight (when allonursing occurs) than non-allonursing females, and didn’t lose a significant amount of weight over the whole allonursing period (though they don’t gain weight, as non-allonursing females did over the same time). The latter suggests that there might be some cost of allonursing, as these females aren’t able to pile on the weight as their non-nursing counterparts do – but as they don’t actually lose weight the long term costs for survival are likely to be low. To determine whether allonursing females changed their behaviour to mitigate the costs of allonursing, I headed to the field to gather some behavioural data to supplement existing focal observation data (following individual meerkat females for 30 minutes at a time and recording their every move). From this data I took four behaviours of particular interest: raised guarding, and burrow maintenance (cooperative behaviours that I expected allonurses to do less of when lactating), and active foraging and resting (which I expected allonurses to do more of when lactating). 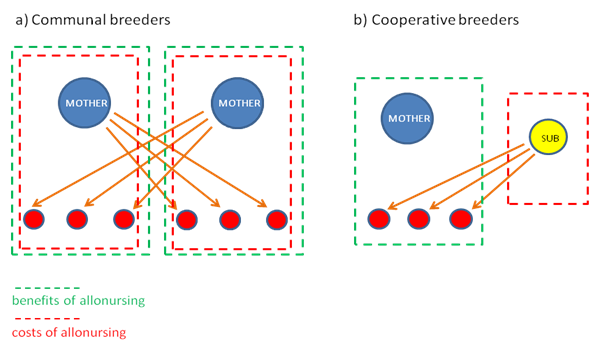 Only one of these behaviours fulfilled my predictions: allonursing females did forage more when they were lactating (relative to pre- and post-lactation measures, and relative to non-allonursing females). Contrary to expectations, though, there was no difference in how much time they spent resting, and instead of decreasing time spent participating in other costly cooperative behaviours, allonurses increased their input in raised guarding and burrow maintenance while lactating. Like saddleback tamarin mothers, do meerkat allonurses increase rate of foraging while lactating? So what does this actually tell us? It seems that the jury is still out on whether allonursing actually carries a cost to subordinate meerkat females. Given the substantial costs of lactation to mammalian mothers, what are we missing? In this paper I propose two possible answers. First, allonursing may be a “low-cost” behaviour, for example, because most allonurses have recently lost litters of their own, meaning they may have excess milk (MacLeod et al. 2013). Allonursing only when the “costs” are low occurs in other species – such as lions, for example, which are tolerant of sneaky cubs trying to suckle only when they have small litters and can afford an extra occasional mouth to feed, or when their own litters are older and less reliant on their milk (Pusey & Packer 1994). Alternatively, the extra foraging that allonurses appear to do may successfully mitigate the costs of allonursing so that those costs are not apparent – despite the unexpected increase, not decrease, in cooperative behaviours. Of course there are issues with this type of approach, which prevent us from making definitive conclusions, and which necessitates the need for further work. It wasn’t possible to manipulate allonursing status in such a way that allows us to control for other factors that may be associated with allonursing (ie. make some females lactate, and prevent others from doing so) – as it is, the allonursing group in this study are self-selected, and though we controlled for as much as possible in our models, it is of course always possible that we’re missing something that’s linked to that self-selection. Hopefully this paper suggests some interesting avenues of further research. That I didn’t find any really obvious costs of allonursing in meerkats, though it could indicate that they successfully mitigate costs, makes it important that we try to quantify how much milk is actually being transferred. This will allow us to compare the relative costs and contributions of allonursing to maternal lactation more meaningfully. Clutton-Brock TH, Albon SD, Guinness FE. 1989. Fitness costs of gestation and lactation in wild mammals. Nature. 337:260–262. Clutton-Brock TH et al. 2001.Cooperation, control, and concession in meerkat groups. Science. 291:478–481. Hodge SJ et al. 2008. Determinants of reproductive success in dominant female meerkats. J Anim Ecol. 77:92–102. Porpoise Killing Seals…Dramatic New Behaviour! 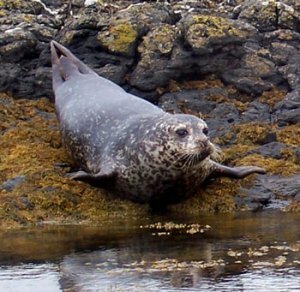 Fascinating seal behaviour – who knew?? Scientists have discovered through DNA analysis that harbour porpoises (Phocoena phocoena) that have washed up severely mutilated and dead along the Dutch as well as the Belgian and northern France coastline beaches with an unknown cause of death and mutilation were actually attacked by grey seals (Halichoerus grypus). This is a new behaviour for the normally fish eating mammals.